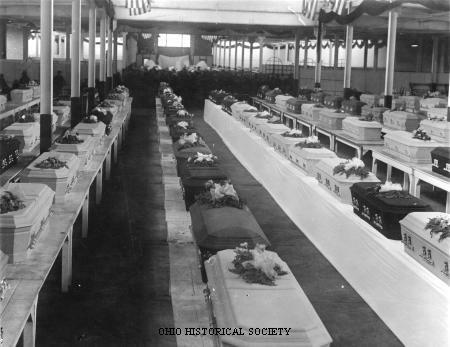 On April 21, 1930, the Ohio Penitentiary experienced the worst disaster in its history. A terrible fire broke out in the early evening, eventually killing 322 inmates. Not only was the state penitentiary fire the worst fire in Ohio's history, it was also the worst fire in American prison history. There was little debate about the source of the fire. Apparently, a candle ignited some oily rags left on the roof of the West Block, also known as the Big Block, of the penitentiary. The fire became noticeable just after prisoners were locked into their cells for the evening. Although many inmates died from the flames, others perished after breathing poisonous smoke from some burning lumber. The slow death that comes from burns and smoke-choked lungs continued to claim victims today of the fire at Ohio State penitentiary where 319 men already have perished. Hospitals reported there were approximately 150 injured who had slight chance of recovery and 100 others were suffering minor injuries. The death list was expected to grow hourly in this, the worst prison fire in modern times. Pending the findings of the investigation ordered by Gov. COOPER it was said by officials that all evidence indicated prisoners had started the blaze, originating in Section "I", licked along dry timber into Section "H", from Section "H" to Section "G", and thence upward to where 300 prisoners, trapped like caged animals, tore futily at steel bars that became their pyre. It was a twilight of indescribable horror. On April 21st 1930 a major fire killed 322 inmates and seriously injured 150. A cordon of penitentiary guards was thrown about the towering prison walls. Other squads took up vantage points in sentinel towers and by this time 500 soldiers from Fort Hayes, local military post, were on the scene. Machine guns were mounted at the gates and on the walls. Bayonets were fixed and the troopers were ordered to shoot to kill. 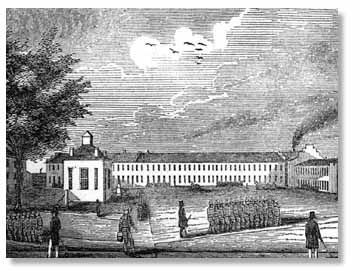 A troop of National Guardsmen soon augmented the regulars, and a half hour after the fire started the prison was completely surrounded.